gets underway at 9:15 a.m., and will be held every Sunday thereafter. Discover which of nine energies dominates your interactions with the world around you, yourself, and God. October 9, discover which of nine energies dominates your interactions with the world around you, yourself, and God. The ‘Growing Towards God’ series started by Nancy Phillips, continues with a five session course called ‘Inner Transformation Through the Enneagram’. Janelle Schneider will be the facilitator. The course is offered on the second Tuesday of each month, from September 11 to December 11, and each session runs from 6:30 to 8:30 p.m. You may want to come at 6:00 p.m. to enjoy the optional brown bag supper with your classmates (bring your own brown bag!). On Wednesday, September 19, Bishop Donald will celebrate the inauguration of the new Trinity Anglican Ministry, and will install the Rev. Liz Richens (née McKendry) and the Rev. Michael Bruce as co-incumbents of the Ministry’s component Parishes of St. Anne, St. Barnabas and St. Martin-in-the-Fields. 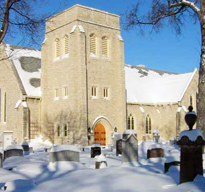 The service will be held at St. Barnabas, 730 McPhillips Street, at 7:30 p.m. All are welcome.